When you're off to university or college, or just moving away for the first time, there's enough to stress about before even thinking about your new home - your student room. Most university dorms are the same, with furniture that perhaps leaves a little to be desired for, especially if you're used to a beautiful room at home, one that you've probably spent years getting exactly how you like. Storage - Most college dorms will provide you with a wardrobe or chest of drawers (or both if you're lucky), however if storage is going to be limited it's probably a good idea to have a bit of a cut throat clear-out of any old clothes/belongings before you go. There's nothing less welcoming than a 'floordrobe' of clothes that don't fit anywhere else (trust me - I know this from experience!). For other bits and bobs though, I love these spacious IKEA storage boxes which come in a few different colours, and hold a LOT of stuff. Another bargain storage tip is prettying up a jam jar - simply tie a ribbon around one to create a beautiful way of displaying pens or make-up brushes, especially good if your desk will double up as your 'getting ready' area. I currently use these Laura Ashley storage boxes to hide all my stationary. Bedding - Taking your favourite duvet with you will make you feel more at home, and how about matching cushions/throw/towels to create a theme for your space? Desk - This will be where you'll probably spend a huge amount of time, so definitely should reflect your personality and be somewhere you feel comfortable. Bringing your favourite cushion from home can spice up your desk chair, and using pretty folders and boxes to store your notes can brighten up any shelf. Plus I don't know if it's just me, but pretty pens and notepads will definitely made me more interested in studying! Whilst some really stylish stationary can often set you back, why not try transforming old boxes/folders with wrapping paper or wallpaper (have a look on eBay for some cheap scraps)? A memo board is a great way of displaying important bits and bobs, but it doesn't have to look boring - I covered a cheap board with material I bought off eBay, and use it to display my jewellery. 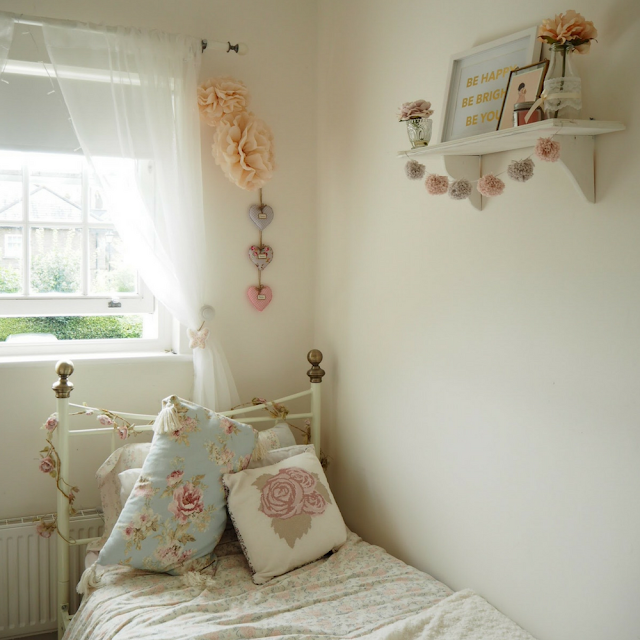 Wall space - Bare walls can often be a bit of a problem in student rooms, however if posters aren't your thing then there are a few other things you can do. How about printing out some of your favourite pictures of family and friends in polaroid form and stringing them up across a wall or placing them on a memo board like I have? I recently discovered the brilliant app Cheerz, through which you can easily print photos directly from Facebook/Instagram as high-quality polaroids for good prices. Bunting can also easily jazz up plain areas, and can be picked up quite cheaply too. The Range sell some lovely vintage bunting, but you could also make your own really easily. See my DIY no-sew post here. If you're not allowed to use sellotape or blue-tac to stick things to the walls, how about using Command Strips - damage-free adhesive hanging strips which don't leave a mark on the wall. 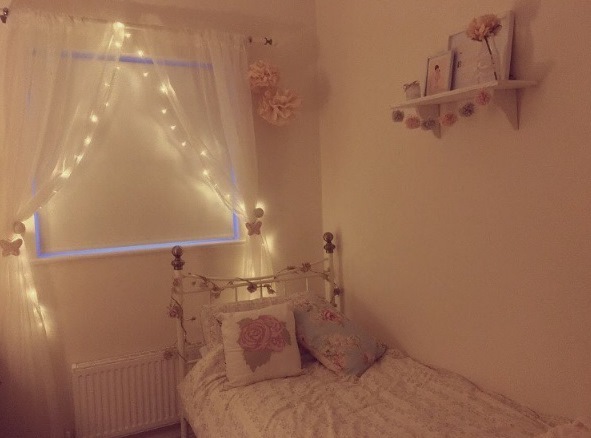 Finally, fairy lights are a really great and cheap way to create an atmosphere and dress up your room. These ones are just £1.99 - in my spare room I've tied lights around the curtain pole and draped sheer drapes over the top to soften and create a cosy atmosphere. What are you tips for decorating a university dorm, and creating a home from home?